Letting some fresh air inside is always a good idea, but during the winter it seems a bit wasteful to fling open the window and let the fresh air in at the expense of all that hot air going out, and wasted energy with it. What's a good way to have fresh air inside that keeps wasted energy low? Good ventilation needs a strategy of its own accord. It doesn't just happen. It will depend on what climate zone you're in, and what your building is, but from your question, I'm going to assume that winter means you're having to use some space-heating to get the home to a decent temperature. The very best ventilation strategy we have, is to make sure that your dwelling has a high degree of air-tightness, and then to use Mechanical Ventilation with Heat Recovery (UK name), which is also known as Heat Recovery Ventilation (HRV), as mentioned by half-integer fan. This will require ducting around your home. Typically, the air is introduced into bedrooms, and extracted from kitchens and bathrooms. The intake air and extract air are propelled by fans, and pass over a heat-exchanger, so that the intake air absorbs heat from the extract air. It is difficult to get the specification right. Don't do it yourself. Use a firm that has a strong reputation for MVHR. The quality of specification and implementation are everything. Passivhaus-approved MVHR systems have very efficient fans, and very efficient heat exchangers. Open all windows wide but only for a short period. It will replace the air, but won't cool down the walls. This is the usual recommendation of gas companies. 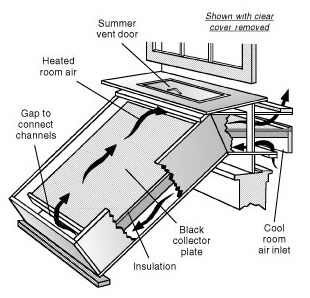 Take a look at a passive solar heat collector. They work on the principle of thermosiphoning. The design in the link and the picture below has an additional top vent exposed to the outside so you can close the top interior vent and draw air out of the building during the summer. I've seen more advanced designs that include doors that automatically close at night when there isn't enough heat to push the air. A slight modification of this design could draw cool air from outside through the bottom of the collector rather than from in the house. The air would be heated by the time it entered the house. You don't state how much change you are willing to consider. 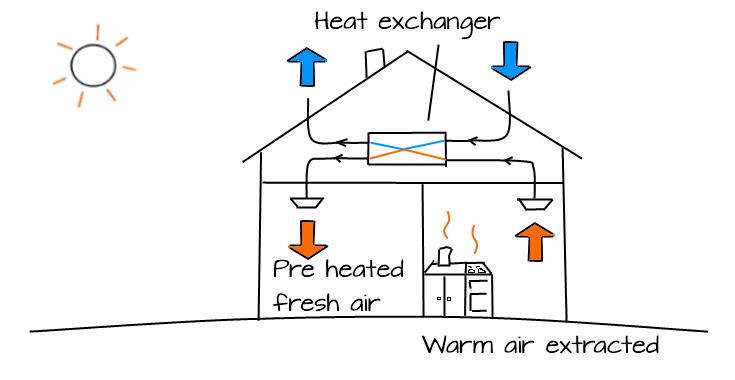 A device called a Heat Recovery Ventilator (HRV) passes the outgoing air and the incoming air through a heat exchanger and transfers the heat from one to the other. It usually would be connected to your central air ducts to distribute the incoming air, and would require pass-throughs for the intake and exhaust with the outside. If you have the property, and resources, make sure your house is tight. Then, dig a four foot trench that zigzags across a suitable part of your yard, taking care to call Mis Dig for location of underwater electrical, water, and gas lines. Lay PVC pipe into the trench, making sure it's water tight. Bring one end up from the ground, above the maximum snow depth, with a u fitting that points the pipe toward the ground. The other end of the pipe is brought inside your home, with an airtight fitting around the entry point. Place no-see-em proof screen on the outside pipe end. Install a wind-tubine driven, whole house fan to expell old air. The lower inside pressure will cause to outside air to travel through the buried pipe, and pre-warm it before it enters the house. I most of the nation, even up where I live in U.P. Michigan, the temperature 4 foot (1.2 metre) underground remains at about 45 degrees F (7°C). It may not be toasty warm, but the fresh air will be much warmer than the direct, above ground air. As a bonus, hot supper air is replaced by cooler fresh air that again flows through the underground pipe in summer. You get free air conditioning, and air heating. Another very good product is the Evacuated Tube Solar Collector. It works at any outside temperature. It's used to heat water, which can surround a heat exchanger through which your outside air gains access to your home, or run the hot water through room radiators to directly heat your home. You should turn off your heating at least half an hour before opening the window, and do not switch it on immediately after closing it. Open the window when temperature of air gets significantly lower and open it when it'll go back higher. Open all the windows, and for the short period of time. Warm air gets immediately sucked out and you'll feel when it is replaced by cold one. Than you should close all windows. A few cubic metres of air are heated up and cooled down quickly. This is why fan heaters are usually a bad idea. They heat the air and before the air had a chance of heating something more substantial, it creeps out through some crevice you didn't know existed. I lived in a flat with a tiled woodstove for a while and it was fantastic. The stove gives off heat all day after just heating a bit in the morning. Even frequent opening of windows doesn't affect the warmth of the room, which is kept at a constant, comfortable room temperature. Rather than worrying about opening your windows, I think it may be more efficient to think about your insulation and the way you heat your house. Positive input ventilation* (PIV) is a lot cheaper to install then a heat recovery system; it pushes some of the air from the loft into the house. The air in the loft tends to be warmer then the outside air. I have put a MVHR system in our bungalow, as we had so many issues with ventilation, it is great! Being a bungalow the ducts were easy to install. In a property we rent out, I put in a PIV system, as it is good enough to stop mould, putting in a better system would not have got any more rent. *I couldn't locate any generic info on the web about PIV, but here are a few example systems (each explains the device function): Envirovent, Greenwood, Nuaire, Solarcrest. There is a simple answer that does not require significant modification to an existing residential or commercial building. This is the standard high efficiency HVAC answer to the question: Heat air as it enters. This is based on thermodynamics. The efficiency of a heater is based on the temperature difference between the heat source and the cold sink. Therefore it is always better to heat incoming winter air than heat inside air while leaving the windows open. The more efficient choice, is often, and certainly so in this case, the more sustainable one. Window heat pump manufacturers know this, being in the HVAC business. If you buy a window unit and set it to heat and ventilate using outside air, you will meet your objective. If you have central heating, it will fire up at a shorter duty cycle (less constantly) and you will have only a slight increase in heating cost, the minimum reasonably possible with the outdoor ventilation you need. There is a HRV without ducts, which can be installed relatively easy in houses without HRV. The first OEM name is "inventer", but there are cheaper alternatives. It works like this: There are two ducts in the outer walls of the house at markedly different places in the house. The short ducts contain a fan and a heat storage unit. The fans realize a cross ventilation, which changes every minute the direction. Thus, the heat storage heats up during outflow, and gives the heat back to the fresh air during inflow. One problem with such a system is the acoustic isolation. Not the answer you're looking for? Browse other questions tagged energy heating home building ventilation or ask your own question. MVHR no longer the ventilation of choice in some Nordic countries? Can you fit double glazing with secondary glazing?